(CNN) What are the ingredients of a good scary movie? Whatever gets your goosebumps going, it’s a good time of year to revisit some frightening flicks from the past. Here are seven, in a mix of scary sub-genres, that deliver the jolts. What it’s about: A shy teenager with telekinetic powers is bullied by her high school classmates and smothered by her religious fanatic mother. After falling victim to a cruel prank at her school prom, she unleashes a horrific revenge. Why it’s scary: Brian de Palma’s classic film — the first ever adapted from a Stephen King book — is certainly dated, but the huge hair and ruffled tuxedo shirts aren’t its most terrifying aspects. Even the climactic scene where Carrie finally exacts her revenge isn’t all that scary. You’ll likely find yourself cheering for her as her mean classmates die in a variety of ridiculous ways. What’s most unnerving about this movie are the characters. From Carrie’s abusive mother to a bunch of sociopathic teenagers (including a young John Travolta), the people of this Maine town are cruel and heartless. Freakiest scene: It has to be the one where Travolta and his buddies break into a farm and laugh as they bash in a pig’s brains with a sledgehammer. What it’s about: A mute, masked killer escapes from an asylum and stalks a babysitter and her friends in a small Midwestern town on Halloween night. 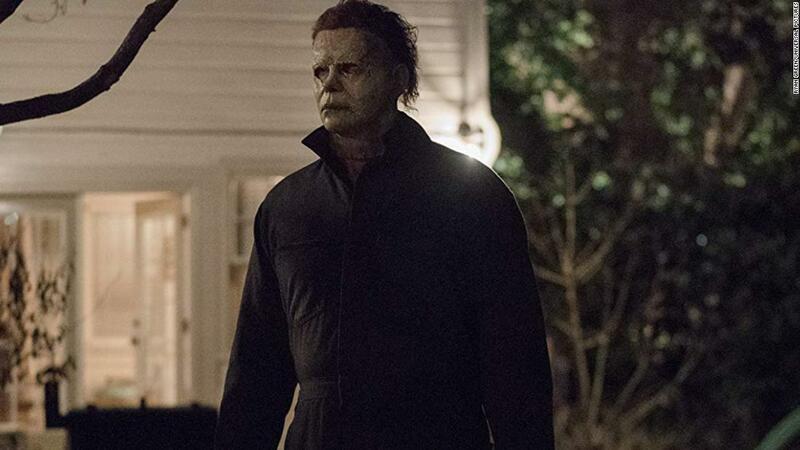 Why it’s scary: If you liked the new “Halloween” — in theaters now — you should skip all the other sequels and go back to the original, which made a star of Jamie Lee Curtis and set the bar against which all slasher movies are measured. With a minimal budget, a few shadowy interiors and a nerve-jangling score he composed himself, director John Carpenter made a visceral thriller that still holds up four decades later. The last 45 minutes are one scream-worthy moment after another. Freakiest scene: The flashback opener, seen through the eyes of a masked killer who grabs a knife from a kitchen drawer, climbs the stairs of his family home and stabs his sister to death. Their horrified parents arrive and pull off his mask to reveal 6-year-old Michael Myers, wearing a clown costume and holding the bloody knife. What it’s about: A writer takes a job as winter caretaker of a remote, snowbound mountain lodge that’s haunted by supernatural forces. The isolation drives him insane, putting his wife and young son in danger. Why it’s scary: The twin girls. The blood pouring from the elevator. The axe through the door. REDRUM. Director Stanley Kubrick packs a lot of unsettling images into his artful adaptation of Stephen King’s novel. But nothing’s scarier than Jack Nicholson’s malevolent leer as he pursues his family through the empty corridors of the hotel. Freakiest scene: When wife Wendy peeks at her husband’s manuscript and finds he’s typed only page after page of the line, “All work and no play makes Jack a dull boy,” she suddenly realizes the depths of his madness. What it’s about: A couple’s marriage is tested when they open an exotic puzzle box that reanimates the husband’s dead brother and summons a group of sadomasochistic beings. Why it’s scary: Clive Barker’s classic — the first in a long line of “Hellraiser” films — is not for the faint of heart. Everyone knows Freddy Krueger, Jason and Ghostface, but does anyone remember Pinhead? That decorative box looks like it came from Pier 1, but as soon as it’s opened, Pinhead arrives and literally all hell breaks loose. If you’re patient enough to deal with some bad writing and subpar acting, you’ll be treated to some of the best old-school visual effects Hollywood could come up with in 1987. The make-up, animatronics and puppetry are so much more convincing than most modern-day CGI that you will be terrified about what happens next. Freakiest scene: When wife Julia gets her first taste for blood, there’s some hesitation, but not for long. Soon she’s bringing home a series of unsuspecting men to meet their hellish fate. What it’s about: A man awakes in a London hospital to discover a virus has decimated the city and turned most humans into bloodthirsty zombies. He and a small band of survivors must seek safety. Why it’s scary: Before “28 Days Later,” most zombie films depicted the undead as slow, shuffling creatures that are easily outrun. But director Danny Boyle upped the tension by showing spry zombies sprinting after their prey — a device employed later in “Dawn of the Dead,” “World War Z” and other movies. Like “The Walking Dead,” the film also shows that in a post-apocalyptic world, the biggest threats can come from not from the infected but from other humans. Freakiest scene: Frank, a kindly man with an adolescent daughter, becomes infected when a drop of tainted blood falls into his eye. Realizing what is about to happen, he tells his horrified daughter to get away from him before he tries to attack her. What it’s about: Disturbing things start happening to a single mother after her young son finds a mysterious children’s book about a menacing being called the Babadook and becomes convinced it is real. Why it’s scary: A key element in horror movies is stress, and “The Babadook” is an hour and a half of nothing but stress. Jennifer Kent’s psychological horror film has all the elements of a supernatural story — unexpected visions of a shadowy spirit, a creepy object that keeps reappearing — exacerbated by scenes of an exhausted mother trying to cope with her tantrum-prone son. If we’re not listening to the boy screaming on a trip to the supermarket, we’re watching he and his mother cower in fear as the Babadook torments their lives. There’s no relief from the tension in this movie. Freakiest scene: It’s probably when the mom visits a police station to report the creepy children’s book that keeps reappearing at her home. We can’t reveal any more because the element of surprise makes the scene. What it’s about: A family must survive in a post-apocalyptic world overrun by sightless, predatory creatures that use their exceptional hearing to hunt humans. Why it’s scary: Writer-director-star John Krasinski uses sound, and the lack of sound, to boost suspense to almost unbearable levels. To stay alive in a world of constant danger, the two protective parents and their kids must be quiet at all times — which makes every electronic beep or shattered glass a jarring assault on the nerves. Freakiest scene: Pregnant wife Evelyn goes into labor as a creature, drawn by a noise, enters her house. She must struggle to remain silent during her painful contractions.